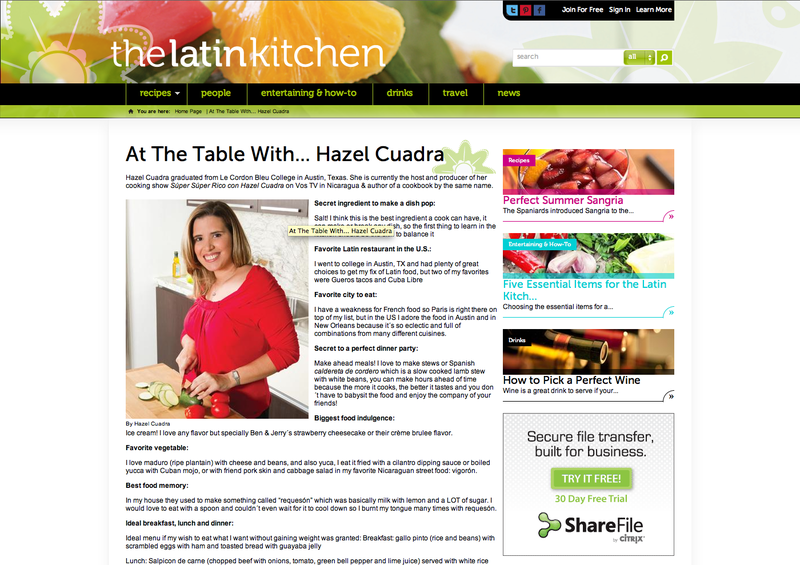 DPCI provided Drupal consulting and Drupal development services to help Latina Media Ventures launch The Latin Kitchen, a new food and entertainment Website for the Hispanic community. Latina Media Ventures (LMV) is an authoritative voice for the acculturated community of Hispanic women living in the United States. Founded in 1996, LMV’s flagship property Latina Magazine is the largest Latin publication in the country with a single readership of 2 million. Across multiple platforms, LMV provides unique, in-depth, culturally-relevant, engaging and inspiring content on the key areas of interest to its audience, including beauty, food, entertainment, fashion, parenting and health. 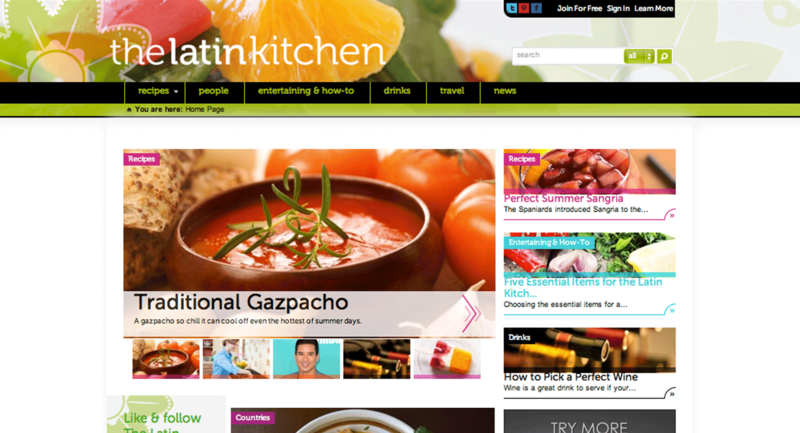 LMV commissioned DPCI to develop The Latin Kitchen, a new food and entertainment Website for the Hispanic community. While recipes would be the core content of The Latin Kitchen, LMV also wanted to provide its community with different collections of rich content and a unique opportunity to create, explore and share recipes. LMV envisioned an interactive Web experience where users would play a large role in content creation. 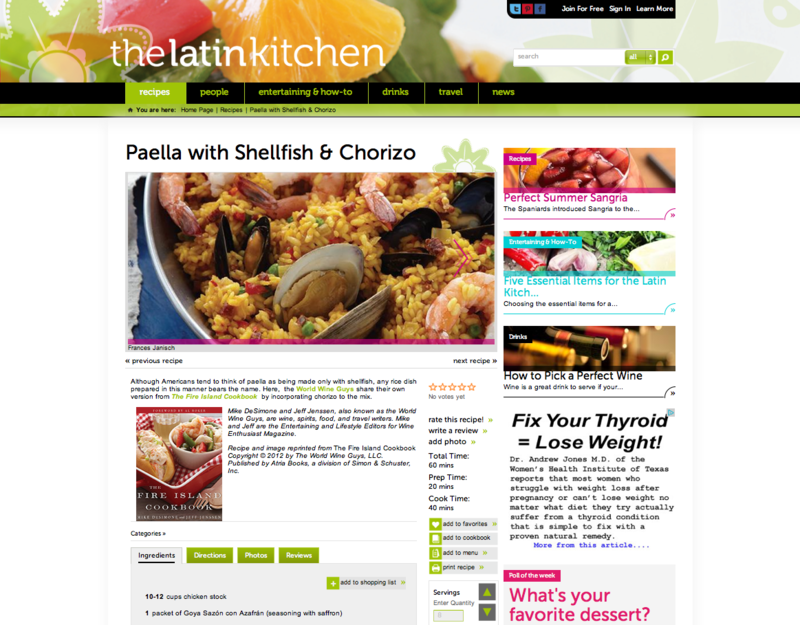 The Latin Kitchen would contain recipe content from www.Latina.com, guest chefs and restaurant contributors, aggregated Web content, and other LMV partners. Registered users could organize these recipes into menus, cookbooks, and grocery lists. Users could also review and rate published recipes and author new content. 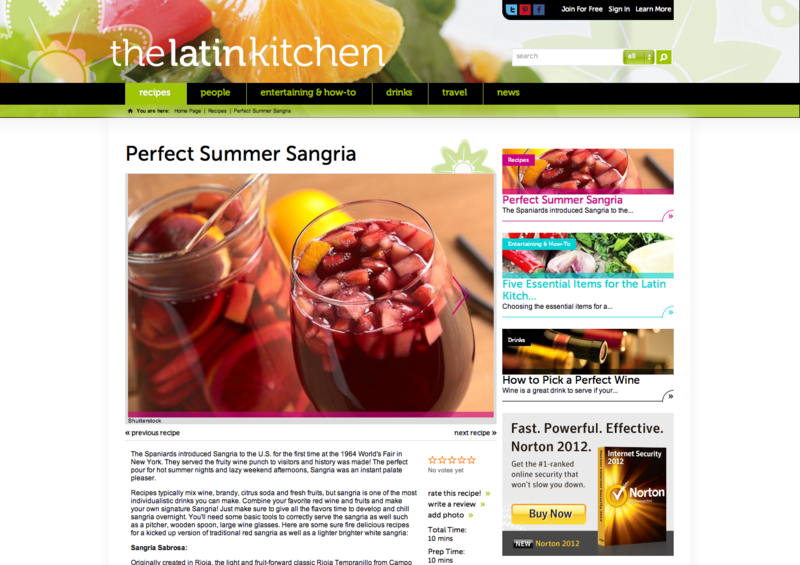 To complete the package, The Latin Kitchen would provide party planning tips for holiday and milestone events, festive drink recipes, and a newsletter for registered users. To maximize visibility, LMV’s goal was to offer these features, and more, to both Web and mobile browsers. To kickoff the engagement, DPCI met with LMV stakeholders to refine wireframes and solution requirements for The Latin Kitchen Website. Then, DPCI and LMV collaborated with eROI, Inc. a Portland-based creative design agency, to turn the wireframes into a design reality. Throughout the visual design process, DPCI closely audited the design comps to ensure that the visual design of The Latin Kitchen was consistent with the defined solution requirements. To support the new home page design, DPCI implemented a rotating carousel, as well as two featured content areas using the Nodequeue and Views contributed modules. These modules provide content administrators with greater control over the selection and sort order of specific content nodes displayed in designated home page areas. In addition, DPCI implemented an expanded main navigation menu site-wide that includes featured nodes and advertising units. To further enhance The Latin Kitchen’s visual allure, DPCI developed slideshows to feature groups of recipes. Each slide contains an image with a teaser that navigates users directly to the full recipe. DPCI utilized the Drupal ImageCache module to handle the varying image displays throughout the Website. DPCI configured a combination of dependable and trusted Drupal modules to support recipe functions including user comments and reviews, personalized menu and cookbook creation, photo uploads and shopping lists. To take online recipes a step further, DPCI implemented a custom set of functions that associate serving size with ingredient quantities. The measurement converter automatically adjusts ingredient quantities based on user-specified number of servings to accommodate any size dinner party. Users can then add the full set of ingredients to a personalized grocery list for their next trip to the market. To help users with their shopping, DPCI utilized a grocery department taxonomy that organizes grocery lists into categories commonly found in markets such as meat, produce, or dairy. Once a grocery list is created, users can add other items to the list, beyond what came from the recipe itself. Registered users can create personal profiles and earn points based on insightful comments, ratings, recipe submissions and uploaded photos. 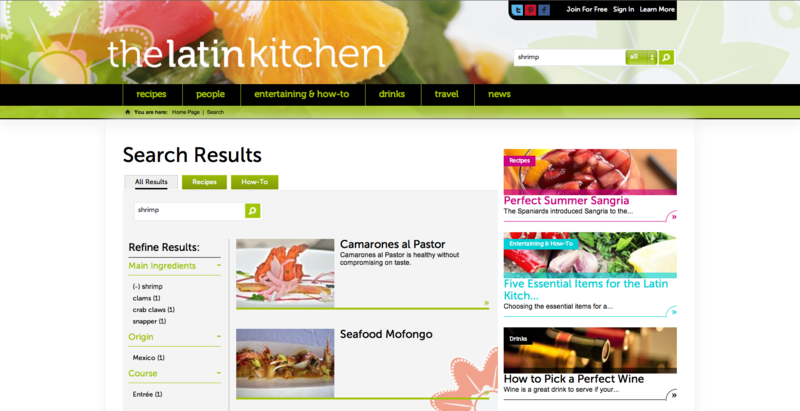 The Latin Kitchen’s back-end interface allows LMV staff to track and edit all user contributions. Automatic notifications alert users when their content has been accepted. To enhance the interactivity of The Latin Kitchen, DPCI implemented Social Media widgets on pages to allow users to quickly share content to social networking sites such as Facebook, Google + and Twitter. For improved site-wide search performance, DPCI integrated Drupal with Apache Solr search platform using the Apache Solr Search Integration module. The content search allows users to narrow search results by content types and refine search results with facets based on taxonomy terms. When viewing a recipe or an article, users can easily navigate to related content by region or by ingredient by clicking on search terms such as “Venezuela” or “Chicken”. DPCI integrated Drupal with the existing www.latina.com PHP scripts for ad targeting and tag output. Sponsor blocks and advertising units are served to the new Website from LMV’s existing Dart for Publishers ad serving system. DPCI also implemented a single mobile optimized theme to provide a consistent user experience across all smartphone and tablet devices. Using Mobile Codes contributed module, LMV content editors can generate unique QR Codes that link users to relevant content. 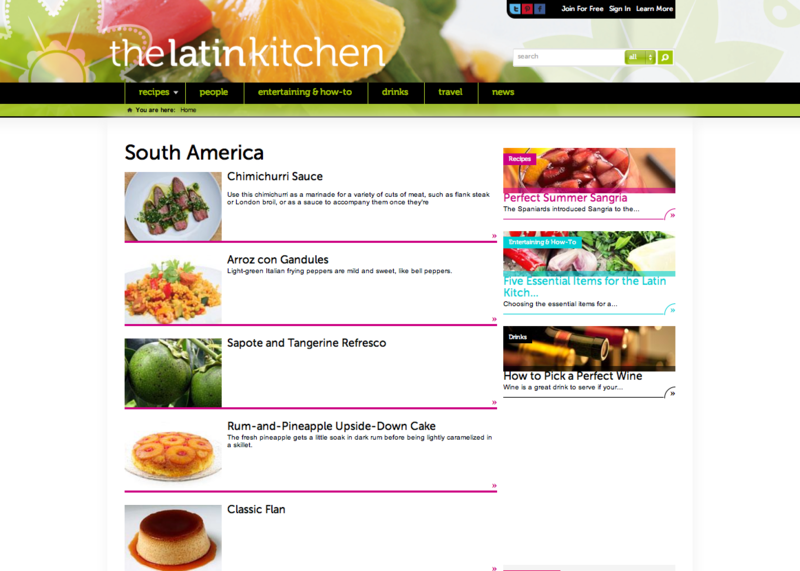 LMV launched The Latin Kitchen, powered by Drupal, in July of 2012. Through The Latin Kitchen, LMV further demonstrates its authority in the Latin American market and captivates a new, mobile audience. 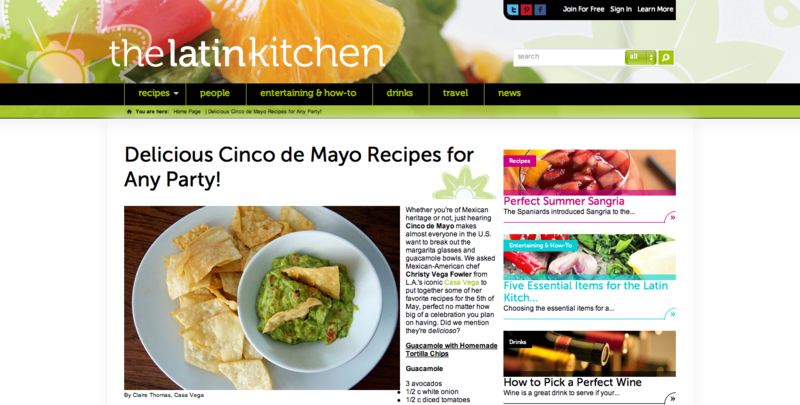 Recipes are the integral component of The Latin Kitchen and users play a huge role in content creation. The Website also presents LMV with new advertising opportunities from standard display ads to sponsorship units that can be integrated with relevant content. While Latin American cuisine is expansive, the new Website effectively covers the edible culture of The Caribbean, Central and South America and provides a start-to-finish resource for Latin-based food and entertaining.